September 7, 2012 — This weekend, members of the American Chiropractic Association (ACA) Board of Governors, many committee chairs, and a small set of association stakeholders will meet in Palmyra, Wis., to begin to chart a 10-year plan aimed at helping the association harness its available resources more effectively and reach important goals. This “visioning” process will begin with this weekend’s session, moderated by JMPT editor Claire Johnson, DC, and noted futurist Clem Bezold, PhD, and will continue later with input from ACA’s House of Delegates, where more voices will become part of this important conversation. 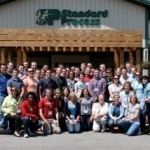 ACA sends special thanks to Standard Process, which is hosting the Wisconsin meeting at its state-of-the-art headquarters, which features a 420-acre organic farm and conference center. Participants will have the opportunity to tour the Standard Process facility and enjoy meals prepared from fresh vegetables grown onsite and used in the preparation of the company’s high-quality nutritional supplements. Look for more information about the “Vision 2022” meeting in upcoming issues of Week in Review and other ACA publications.